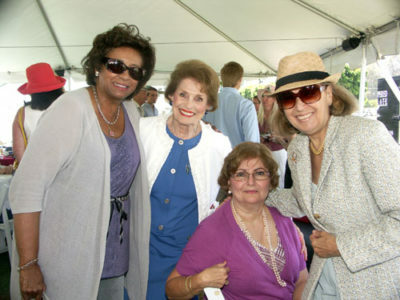 AT POLO BENEFIT were Velma Boone, Yvonne Cazier, Pat Petro (seated), and Alice Weston. The Assistance League of Southern California’s Pre-School and Kindergarten Auxiliary presented its 29th annual Golden Mallet Invitational Polo Benefit on Sunday, Aug. 19 at the Santa Barbara Polo and Racquet Club’s Summer High Goal Polo Season matches. There to enjoy a gourmet alfresco buffet lunch and take their glasses of spirits on to the field for the Divot Stomp between chukkers were event co-chairmen Gloria McClinton Holden, Alice Weston Kopetzky and Patricia Mulville, auxiliary chairman Yvonne Cazier, event sponsor Ambassador Glen Holden, ALSC president Sue Leisner, and Barbara Hardesty. Funds raised will support ALSC’s Learning Center for children from low income families. OPERA GALA drew Brandise Danesewich, Joe Viboonviriyawong, fashion designer Sue Wong. “There’s no business like show business as Ethel Merman sang, but opera is not a business,” said the great Placido Domingo in the intimate setting of Mary and Robert Estrin’s living room on Aug. 28. 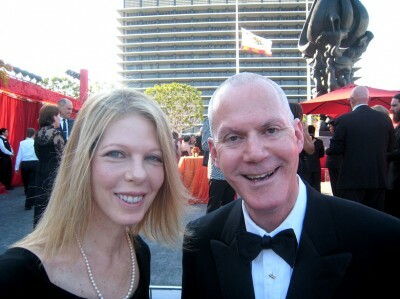 A highlight of this 2012 Gala Committee kickoff party was arias from two young winners of Domingo’s Operalia competition whose thrilling talents reminded supporters of Placido’s commitment to maintain LA’s status as a world-class music center for generations to come. Applauding and preparing for the hard work ahead were Hilary Crahan, her mother Missy Crahan, Jennifer and Royce Diener, Lisa See and Richard Kendall and Dale and Don Franzen. AT COMMITTEE KICKOFF Hilary Crahan and mom Missy Crahan. 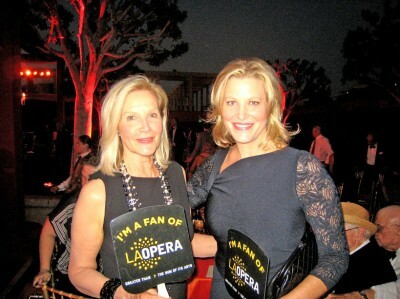 MORE OPERA AFICIONDOS were Shauna Gunn and daughter, actress Anna Gunn. chaired the post performance party out on the Plaza under the stars for more cocktails and dancing to the music of Wayne Forest Entertainment. AVID PLACIDO FANS Jackie Fuchs and David Gindler. Maggie Russell, David Gindler, with friend Jackie Fuchs standing in for David’s wife Kiki who was in St. Louis showing her prized Bichon Frise at the National Dog Show; Delores and Ben Kerr, Sheila Tepper and Susie Goodman, Carol and Warner Henry, Annette and Peter O’Malley, Dominic Domingo, actress of the series “Breaking Bad” Anna Gunn with mom Shauna, fashion designer Sue Wong with Brandise Danesewich and Joe Viboonviriyawong, Janet and Nick Ciriello, and honorary chair Mary Hayley with husband Selim Zilkha. “We raised a record $1.5 million,” exclaimed a very happy Hilary Crahan. 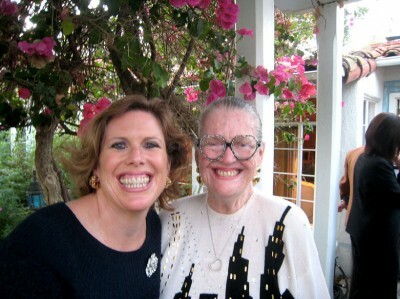 Fremont Place residents Cam Davis and Sam Randazzo hosted “A Soiree for a Cure” on Sunday afternoon, Sept. 9 to benefit AIDS Research Alliance. Eighty guests were treated to a performance of Pasion Flamenca, a group devoted to the Spanish tradition of Flamenco, the electric and soulful sound of Andree Bell Band and Spanish tapas catered by The Paella Project. 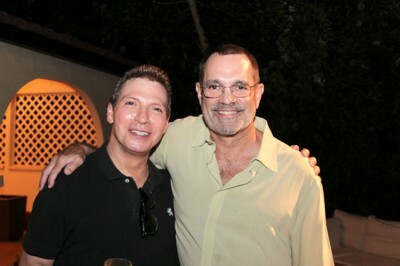 EVENT HOSTS Sam Randazzo, Kenneth (Cam) Davis. AIDS Research Alliance spokesperson actor LeVar Burton thanked attendees for their support which will move the Alliance’s research closer to in-human clinical trials. There nibbling on turkey albondigas and goat cheese tartlets and sipping One Host wine were event sponsor Kathleen Scheinfeld, Scott Shelley, Larry Chrysler, Dr. David Hart and Edward Gould, Sherry Johnson, Jan Michaels and James Frost.